What/who is HPD? Honda Performance Development (HPD) is Honda’s racing company within North America. Founded in 1993, and located in Santa Clarita, Calif., HPD is the technical operations center for American Honda’s high-performance racing cars and engines. In addition to its grassroots motorsports business, HPD is the single engine supplier to the IZOD IndyCar Series and spearheaded Acura’s championship-winning efforts in the American Le Mans Series. Why is HPD entering the karting market? We are continuing to expand our outreach to individual grassroots competitors who are running Honda products. In the past, the CR125 engine kit was only available through Honda Motorcycle dealers. HPD is now making this kit available to individual competitors. Does HPD’s market entry mean that individuals can no longer purchase parts from their current source? No. If a competitor has a current relationship with a parts shop or engine builder, that’s great. HPD’s involvement in the sport will not affect existing relationships. Does HPD’s participation mean that dealers or engine rebuild shops must now buy their parts from HPD? No. Independent shops can continue to purchase parts from Honda Motorcycle dealers. These shops can also purchase parts from HPD through the Honda Racing Line as an alternative source. Why should I as an individual competitor buy CR125 kits/parts from HPD? The Honda Racing Line can offer door/door part delivery through our website sales portal. Our sales staff can also offer technical support, providing racer support for racers, by racers! What engine models/parts are available from HPD? The CR125, which is sanctioned for use in Spec Honda (Stock Moto) classes. Is HPD offering the CR125 as a crate engine? No. HPD is offering a parts kit, which the customer will need to assemble. Will HPD offer any other karting products in the future? HPD will consider expansion of the product line as market needs dictate. What is the Honda Racing Line? Launched in July 2009, the Honda Racing Line is a program targeted at licensed participants in sanctioned amateur and entry-level professional racing. The Honda Racing Line was formed to provide its members with a direct connection to Honda Performance Development and its unparalleled record of success at the highest levels of motorsport. Competitors may register for the Honda Racing Line through HondaRacingLine.com. Do I need to be a Honda Racing Line member to buy parts from HPD? Yes. Currently, we are accepting Honda Racing Line applications in preparation for parts sales. Applications will help HPD to forecast product demand, and ensure timely customer delivery. Be able to prove current membership in a nationally recognized sanctioning body. Demonstrate that you’re a racer; able to provide official race results for two event finishes within the last year. Complete and submit the Honda Racing Line registration form. When CR125 parts go on sale, how much will they be? Price lists will be available in early 2011. Will HPD provide other parts for karters? For now, we are focused on ensuring adequate supply of the CR125 engine/parts to individuals. HPD will consider expansion of the product line as market needs dictate. Who should I contact at the Honda Racing Line in order to obtain more information? Please contact HPD for sales and product information. HPD can be reached via email at grmsadmin@hra.com, or by calling (661) 702-7777. Does Honda offer any contingency money for karters? Not at this time. Does Honda sponsor a particular series at this time? We sponsored the S2 class at the 2010 SuperNats. No sponsorship plans for 2011 have been made at this time. Does Honda have a driver ‘ladder’ development program? Honda’s range of products offers competitors the opportunity to matriculate into more advanced levels of the sport. HPD’s Honda Racing Line staff can be called upon to offer product insight and support. Millville, NJ. (November 7, 2010) – The Honda Performance Development-supported Team Honda Research Rally team returned for the third and fourth rounds of the RallyCar US Rallycross Championship held at New Jersey Motorsports Park, finishing 13th and 4th overall. THR returned with Jordan Guitar piloting the 2007 Civic Si. Changing from the first round, the course was altered to a fraction of its former size, with more dirt sections added in an attempt to increase visibility for a growing fan base. Similar to the first round, each lap featured a jump, and each competitor was required to take the “Joker Lap” during the race, which adding a unique feature and time to that lap. Qualifying and Heat races seeded the top drivers into the Main races. 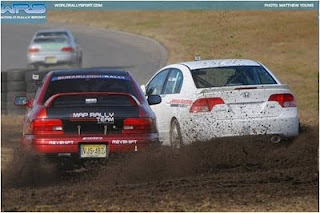 Utilizing experience gained from Round 1, THR equipped the Civic Si with tires and brakes more suited to dealing with the rigors of tarmac driving, as well as rally dampers to cope with the bumpy dirt sections. Throughout Round 3, this proved a good setup and THR was able qualify for the C Main event. "We finished 13th today, I gained some experience with this style of racing, and have confidence that with the HPD-supported Civic Si, we can find a few more places tomorrow," stated Jordan. As Round 4 got underway, THR was able to post competitive times through qualifying and the Heat races, and was top-seeded for the C Main. As the race started, a BMW got the jump on everyone off the line, rocketing from fifth to first place, but through the dirt sections, Jordan was able to overtake the BMW before the end of the first lap. Demonstrating strategic use of the "Joker Lap" and maintaining a smooth and consistent line, THR grabbed the win in both the C Main and the B Main, proceeding to the A Main with the top five 2WD cars, and finished 4th overall. "We had a lot of fun this weekend," Jordan said, "The Honda Performance Development car was reliable all weekend long, and it was great to have the opportunity to drive it. We will continue to make improvements and will return for the 2011 season." ORLANDO, Fla. (Dec. 9, 2010) – With the goal of providing close racing in affordable cars from a variety of manufacturers, Honda and Mazda jointly announce the formation of “B-Spec” Showroom Stock racing. Mazda and Honda debuted their new B-Spec cars at the recent NASA 25 Hour RaceHonda Performance Development, the racing arm of American Honda Motor Co., Inc.; and MAZDASPEED Motorsports Development, the performance division of Mazda North American Operations, today unveiled their entries for the proposed new low-cost B-Spec, developed from the MAZDA2 and Honda Fit. Both cars will be on display at the annual Performance Racing Industry trade show in front of 40,000 racing insiders. B-Spec refers to all cars meeting a common set of rules that can be adopted by any race circuit or sanctioning organization. Together, Honda and Mazda solicited an independent body to develop a set of vehicle specifications that will be available for all to use – the motorsports equivalent of “freeware.” The final rules should be ready for release within 60 days. One of the fastest-growing segments of the automobile business, B-segment cars are among the most affordable, and enjoy great support from younger demographics. In addition to the MAZDA2 and the Honda Fit, the category includes the Chevrolet Aveo, Ford Fiesta, Hyundai Accent, Nissan Versa and Toyota Yaris. 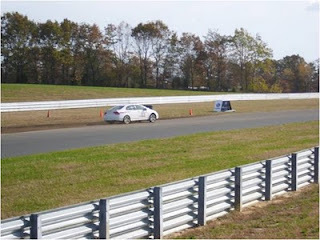 Two prototypes for the class – a MAZDASPEED-run MAZDA2 and a Honda Fit, prepared and entered by Team Honda Research-West – debuted at last weekend’s 25 Hours of Thunderhill season-ending NASA endurance racing contest in Willows, CA. Designed to be an entry-level category, B-Spec cars will feature showroom stock racing cars utilizing stock engines and chassis, fitted with a competition roll cage, racing seat and other safety equipment; and manufacturer-approved suspension components, tires and wheels. Weight distribution will be used to balance performance among competing manufacturers. The manufacturers will use an independent third party to homologate competing cars and provide equalized specifications to any interested sanctioning bodies or race tracks. A racer who builds a B-Spec car will be able to race the same car across multiple sanctioning bodies by simply changing the sanctioning-body decals. Only homologated OEM models will be eligible within the rules. This is intended to be a grassroots class of racing, and at present, there are no plans for a B-Spec professional series. MAZDASPEED Motorsports Development is the motorsports division of Mazda North American Operations, and has provided support and competition parts for Mazda teams and racers since 1983. MAZDASPEED is involved in racing activities at all levels of the sport, from local autocrosses through multiple levels of professional open-wheel and sports-car racing. On any given weekend, more Mazda cars are road-raced than any other brand. Honda Performance Development is the Honda racing company within North America. Founded in 1993, and located in Santa Clarita, Calif., HPD is the technical operations center for high-performance Honda racing cars and engines. In addition to its grassroots motorsports business, HPD is the single engine supplier to the IZOD IndyCar Series and spearheaded championship-winning efforts in the 2009-2010 American Le Mans Series, 2010 Le Mans Series and the 24 Hours of Le Mans. Since 1944, the Sports Car Club of America (SCCA) has championed one mission: To bring motorsports to the masses of American men and women who are passionate about automobiles, speed and competition. From National Championships to regional events, whether professional or amateur, we exist to organize, support and develop auto racing at every level and provide an outlet for you to get out of the armchair and into the action. So, whether your passion is autocrossing, rallying or road racing as a professional or as a weekend warrior, SCCA wants to help you fuel your passion. 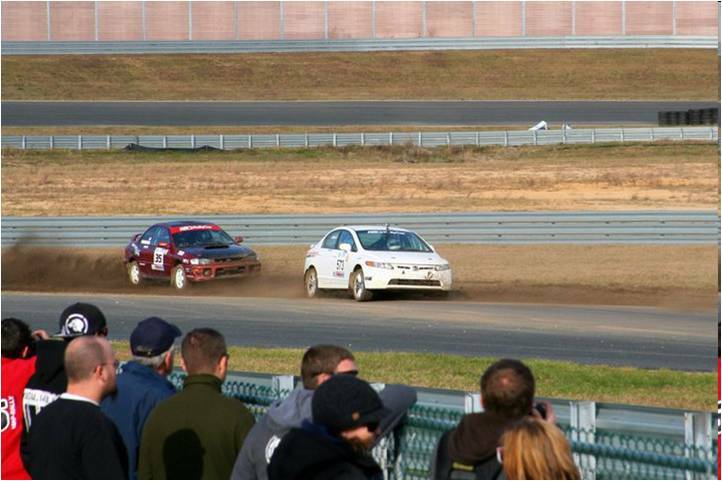 The National Auto Sport Association (NASA) was formed in 1991 to deliver high-quality motorsports events to enthusiasts at major racing venues throughout the nation. NASA has created programs that allow owners of both racecars and high-performance street-driven vehicles to enjoy the full performance capabilities of their cars in a safe and controlled environment. 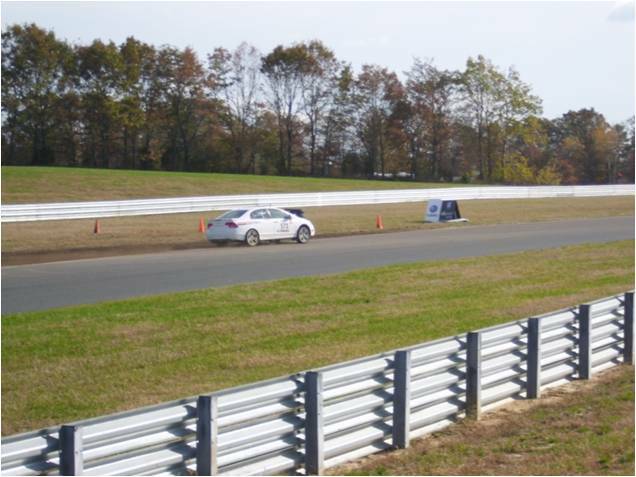 NASA offers many different programs that will allow you to enjoy motorsports on a number of different levels, including our High Performance Driving Events (HPDE), Rally Sport, Time Trial, NASA-X and Competition Racing programs.